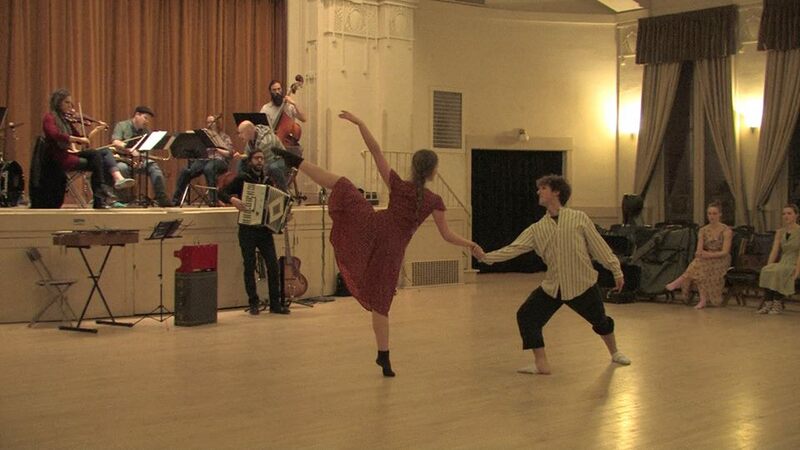 St. Bohéme plays as Elissa Butler and Brian Nelson peform a pas de deux choreographed by Sara Judd, during rehearsals. The Salt Lake Municipal Ballet Co., directed by Sarah Longoria recently presented a collaboration with the local band St. Boheme. The show, titled SON ET LUMIÈRE (Sound and Light), was inspired by the collaboration between the musicians and dancers as well as the architecture of the Ladies’ Literary Club. Upon entering the performance space, the audience saw colorful lanterns extending over the dance floor, referencing the original artwork that was created for the event poster by artist Trent Call. The band was set-up on the small, raised stage with a large dance floor taking up much of the space in the meeting hall. I enjoyed the opening number featuring the musicians alone, and throughout the course of the evening a wide variety of instruments were played including banjo, accordion, violin, cello, saxophone, toy piano, mandolin, trumpet, vocals, and more. The dancing began with a number that showcased all six dancers in the company with lifts, turns, and leaps. The dancers took their seats in the audience, and this added to the focus of the performance as a community event, rather than a formal ballet affair. Watching ballet in this somewhat casual setting did make me think about the small differences in the way that the dancers perform, depending on the venue. In this case, the house lights were up the whole time, and each dancer could look each audience member in the eye. It is a different thing than performing in a huge venue, where the performers are seen as bodies in space with only large, exaggerated expressions visible to much of the audience. For this performance, the company challenged itself to find that fine line between going too big, and going too small. They had the opportunity to connect with the audience in a more subtle way. After a few dances, the choreography also became more playful, and the performers were able to show their own personalities. Brian Nelson was actually laughing out loud with the audience during his humorous performance. This was a moment in which the setting seemed so appropriate because the audience felt truly invited into the space with the dancers. Overall, the dancing and live music worked really well as the collaboration it was meant to be. And in this celebration of music and movement, there were many beautiful long-limbed moments executed by the talented dancers. Although seven choreographers were involved in this project, many of the dances did not have a completely clear identity, unique to that choreographer. There were a few things that contributed to this including the use of the same musicians, costumes, and dancers for the duration of the show. 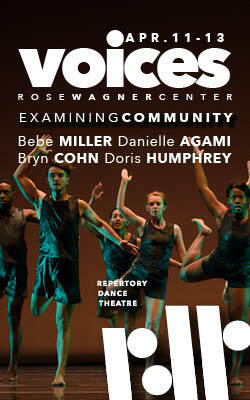 This created a very cohesive evening, but one without the “dialog” of multiple choreographers sharing one stage. One performance was particularly memorable for me. Sarah Longoria featured dancer Cynthia Jackson in a solo that fit perfectly into the performance setting. The dance was carefully crafted to the live music, and it evoked the image of the commissioned poster art. It was as if we were watching someone dancing in secret, or perhaps we were being invited into her world. There were many subtleties in the performance, and the dance was beautifully executed, drawing the audience in for an even closer look. The evening finished with a standing ovation, and an invitation for the audience to join the dancers while the band played. I hope to see more from this company in the future, as perhaps these choreographers continue to find opportunities to set new work, and explore the range of their creative voices. Erin Kaser Romero currently co-directs and performs with Movement Forum; she’s recently presented her own creative work at Sugar Space and her dance films through loveDANCEmore. This article is published in collaboration with loveDANCEmore.